Ricarda’s Oakville is the newest edition to the city’s fine dining scene. Located on Lakeshore Road in the heart of Downtown Oakville, Ricarda’s pairs modern Mediterranean-inspired fare with charming hospitality. It’s the sister property to Ricarda’s Toronto, the hospitality brands multi-faceted flagship. Since opening its doors in July 2016 at the QRC West building, Ricarda’s in Toronto has become popular with local foodies who indulge in the concepts restaurant, bakery, cafe and lounge. 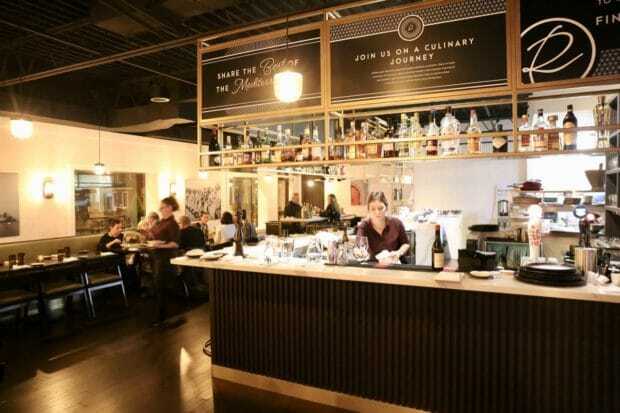 The bar, open kitchen and main dining room at Ricarda’s Oakville. Ricarda’s opened in March 2018 at the corner of Lakeshore Road and Reynolds Street. The owners and management chose Oakville as a second location because the town and its community were reminiscent to them of the cozy and intimate lifestyle of many European villages. 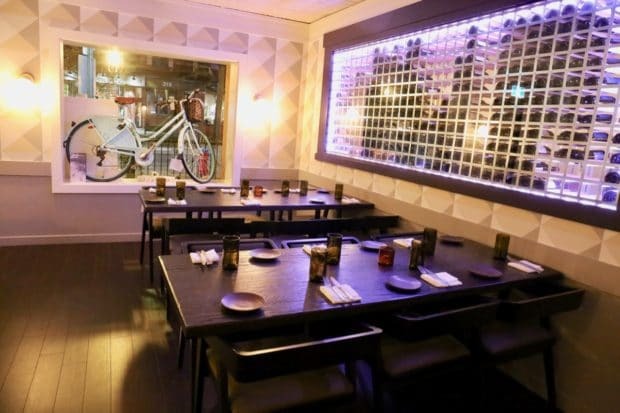 Dining Room: seats 46 people but modifications can be made for private bookings to fit more people. Bar: seats 12 on stools offering guests views inside the open kitchen. Watch the cooks at work! Private Dining Room: seats 20-40 guests. Cocktail style receptions can accommodate larger groups. Wrap Around Patio: seats 54 guests during the warm summer months. 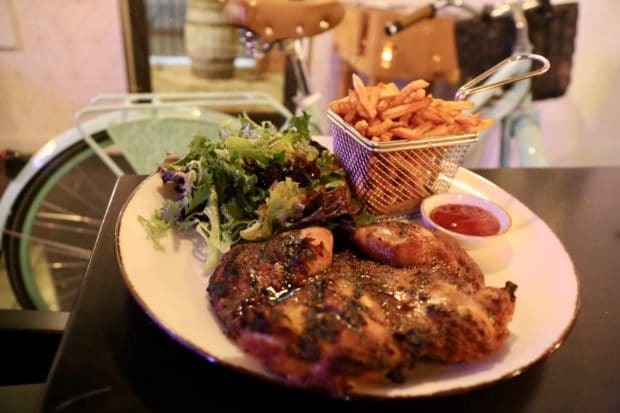 The most sought after al fresco dining experience in downtown Oakville! Inspired by the Mediterranean way of life, Ricarda’s Oakville serves Mediterranean cuisine alongside modern-day classics. Knowledgeable staff offer a memorable experience featuring the finest flavours from Spain, Italy, France, Greece, and Morocco. Chef Julien Laffargue is the Executive Chef at Ricarda’s. A native of France, Chef Laffargue got his start working in the kitchen’s of his uncles inn. Throughout his career Chef Laffargue has trained at some of the top restaurants in Europe, including cooking dinner for former French President, Jacques Chirac. He’s worked on culinary teams that have been recognized with three stars from the Michelin Guide, Prix Culinaire Le Tattinger, World Travel Luxury Awards and Forbes Magazine’s Best Hotels in the World. Before joining Ricarda’s in 2017 Chef Laffargue helped open several Four Seasons Hotels and Resorts, including Four Seasons Bora Bora and Four Seasons Sharm El Sheikh. Ricarda’s Breakfast: two eggs any style, chorizo sausage, potato & chickpea-saffron stew, focaccia. Shakshouka: eggs roasted pepper and tomato, cilantro, goat cheese, sumac, focaccia. 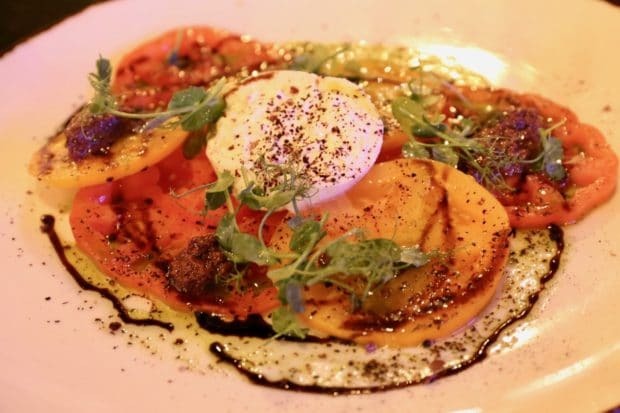 Heirloom Tomatoes & Burrata: sweet tomberry, coffee oil, aged balsamic, nicoise oilve tapenade, bellavitano cheese. Brioche French Toast: cinnamon maple syrup, roasted pecans. Shrimps a la Plancha: cumin seasoned, baby gem, spicy pecans, peaches, grapefruit, valencia orange, cherry tomatoes, date jam. Sumac Salmon Tartare: cucumber mousse, zucchini, passion fruit vinaigrette, pomegranate seeds, squid ink crackers. Create Your Own Salad: starting at $12. Build a customized salad by selecting from a variety of lettuce, veggies, nuts/fruits/seeds, protein, and dressings. Healthy Bowls Under 550 Calories: Israeli Couscous Mix, Yellow Lentil & Chickpea, and Grain Spelt Bowl. 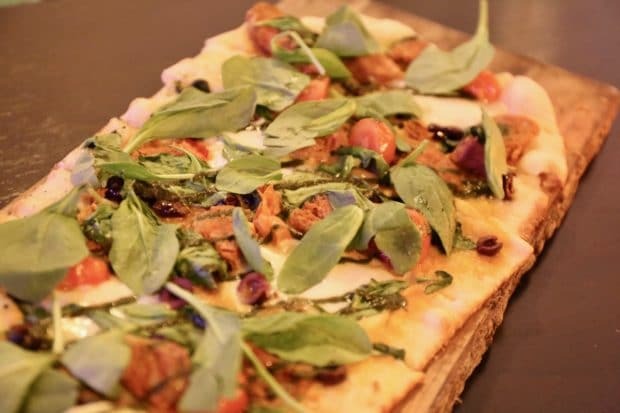 Seville Flatbread: chorizo, black olives, sundried tomatoes, spinach, pesto, stracciatella. Fennel & Tomato Gazpacho: fenugreek pollen, lemon ricotta cheese, grilled fennel, san marzano tomatoes, crostini. 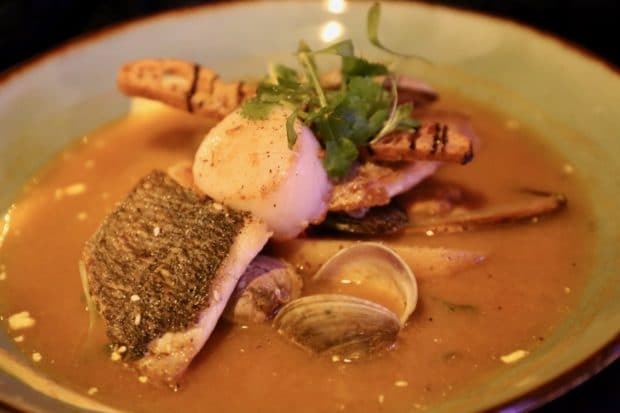 Ricarda’s Bouillabaisse: white fish, scallop, shrimps, mussels, clams, fingerling potatoes, rouille sauce. Grilled Free-Range Cornish Hen: turmeric yogurt, smoked paprika fries, apricots & figs, filed greens. Black Truffle Fregola Sarda Risotto: wild mushrooms, mascarpone, aged balsamic glaze, hibiscus sea salt. Squid Ink Mafalde Pasta: prosciutto, nduja, smoked paprika, octopus, citrus hummus, celery. 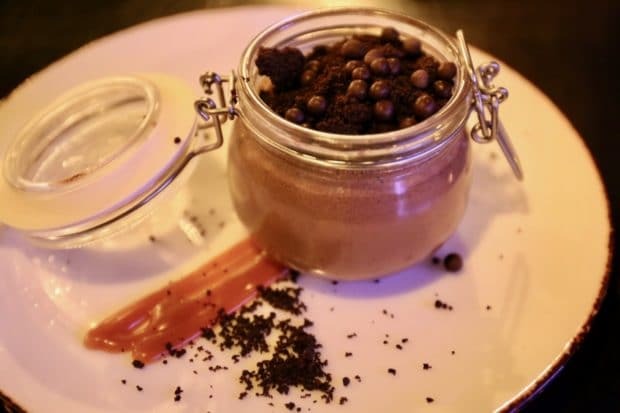 Ricarda’s prix-fixe is perfect for a party of two that want to share and explore flavours and textures. Create your own 4-course meal by selecting one starter, one pasta, one main and one dessert.